The rounded compact* design fits comfortably in your palm and is light-weight** for carrying around all day. The large size programmable buttons have ample button pitch to allow blind touch operation. The IC-F3021 series meets IP54 requirements for dust-protection and splash resistance. The aluminum die-cast chassis is the basis for this rugged construction, allowing long-life usage in various environments. The IC-F3021 series comes with the BP-231 Li-Ion battery pack as standard. Li-Ion batteries have virtually no memory issues and allows you flexible charging. The optional BP-232 provides a high capacity 2000mAh for longer operating time. The 8-character alphanumeric display shows channel, zone, tone code and scanning channel names on the display. A separate row of operational icons indicate battery, signal strength, RX/TX and other radio conditions. The IC-F3021 series covers a wide frequency range with one version 136-174MHz. Wide and narrow channel spacing (25, 12.5kHz) is programmable per channel. The IC-F3021 series has a 40-pin expansion socket for adding an optional board. A voice scrambler provides secure conversation and the DTMF decoder features has ANI capability, depending on the installed board. 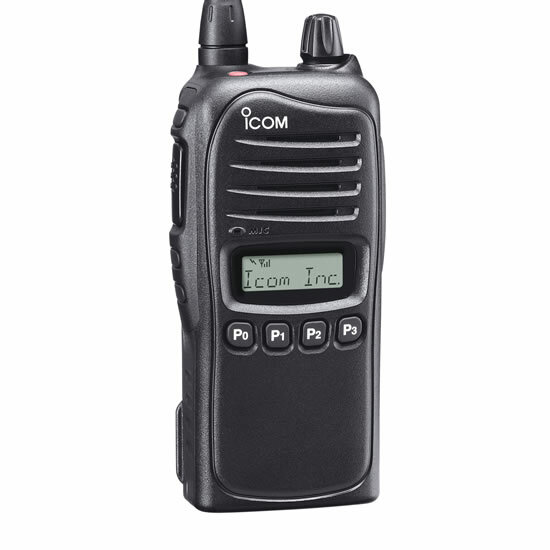 With one of Icom's optional headsets and PTT/VOX unit, the IC-F3021 series offers hands-free operation.